Madeira is a group of islands located in the eastern Atlantic Ocean about 870 km (540 mi) southwest of Lisbon, Portugal and about 580 km (360 mi) west of the coast of Morocco. The group includes one large island, the Ilha de Madeira, and a number of smaller islands. The islands were visited by Roman sailors and perhaps by the Phoeniceans, but there was no regular contact with Europe until Madeira was rediscovered and named by Portuguese navigators in 1418. The islands have been Portuguese ever since. In 1974 they became an autonomous region of Portugal. With a population of about 275,000, the islands are a very popular year-round resort, especially for Europeans, as well as a popular stop for cruise ships. 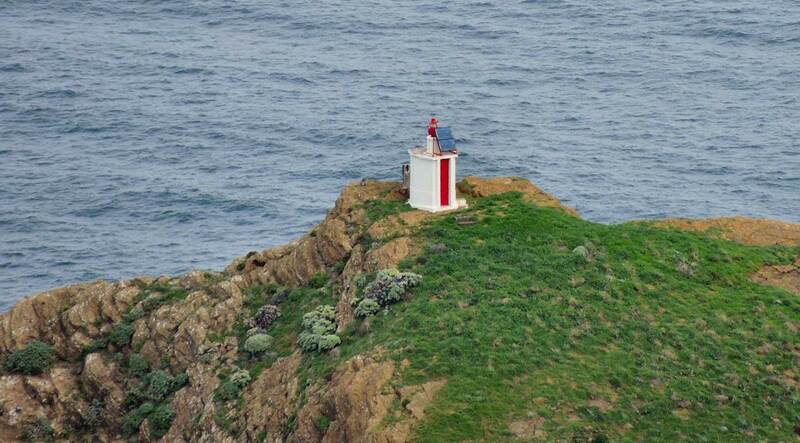 The Portuguese word for a lighthouse is farol, plural faróis. 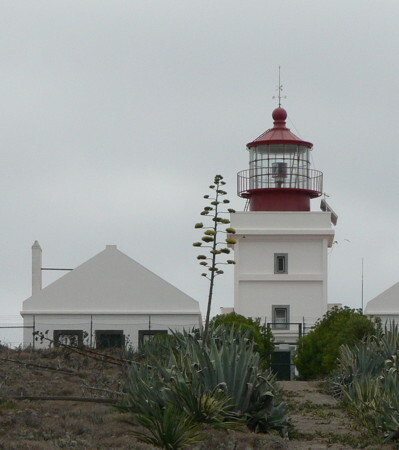 Lighthouses in Portugal are owned by the navy (Marinha de Portugal) and operated by the navy's lighthouse directorate (Direcção de Faróis). In 2013, the Navy announced an open-house program that opens the major lighthouses on Wednesday afternoons. ARLHS numbers are from the ARLHS World List of Lights. 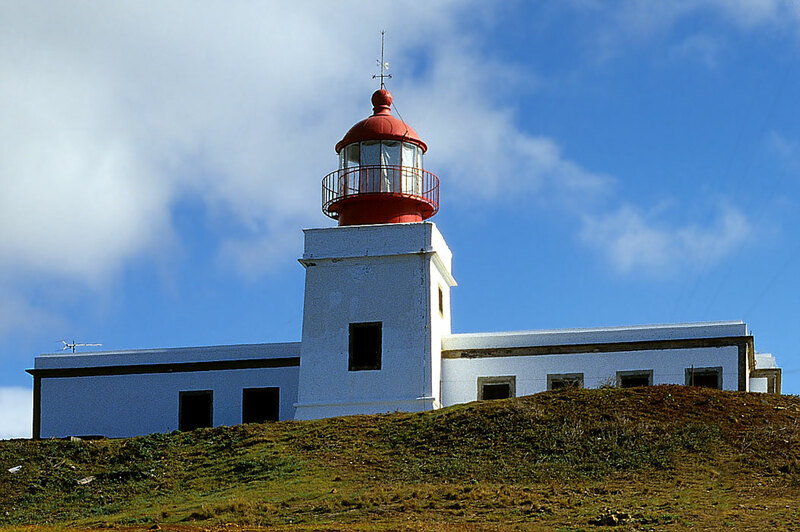 PT numbers are from the Lista de Faróis published by the Portuguese lighthouse directorate. Admiralty numbers are from volume D of the Admiralty List of Lights & Fog Signals. U.S. NGA List numbers are from Publication 113. Photos by various photographers posted by Alexander Trabas. Rainer Arndt, Carlos Maria Silvano, Werner Seiler and Helmut Seger contributed photos for Madeira. 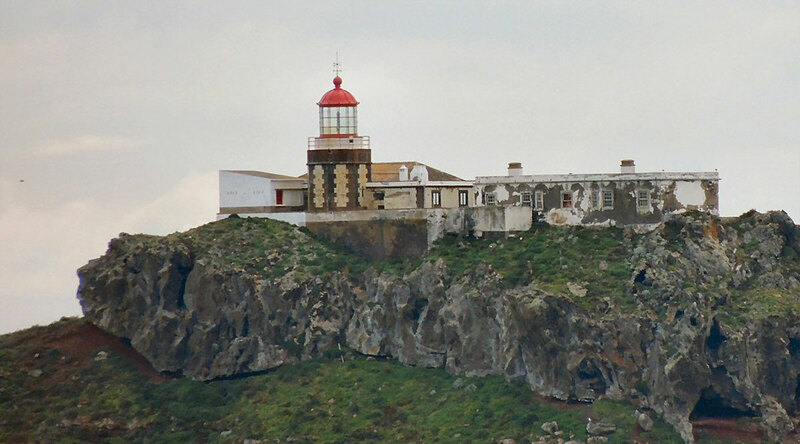 This Portuguese Wikipedia page links to articles on the country's lighthouses. 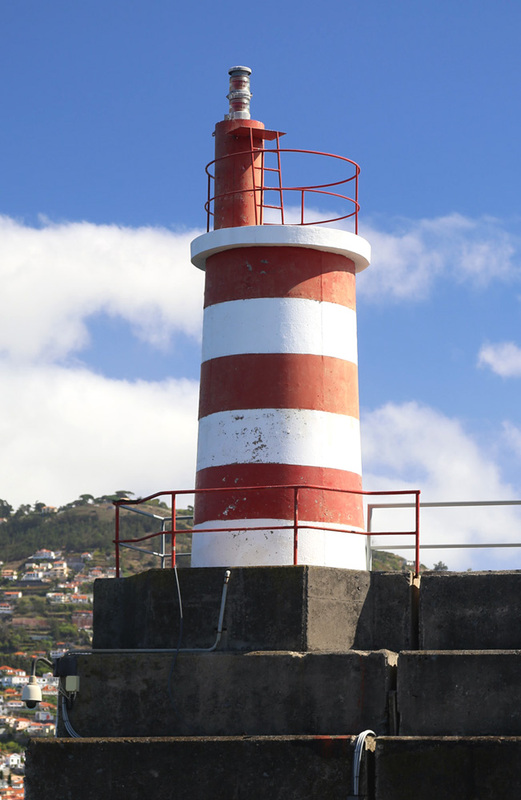 The Madeira lighthouse photos are also available in Wikimedia's Lighthouses in Madeira category. Note: The Ilhas Selvagens (Savage Islands) are an archipelago of small islands located 280 km (175 mi) south of the Ilha da Madeira and 165 km (105 mi) north of the Canary Islands. The islands have no permanant population and have been a protected nature reserve since 1971. Rangers from the Madeira Nature Park staff an office on Selvagem Grande year round. 1977. Active; focal plane 163 m (535 ft); white flash every 4 s. 10 m (33 ft) round cylindrical tower, flared at the top and bottom and colored with red and white horizontal bands. A closeup photo is available, Trabas has Seiler's distant view from the sea, and Bing has a satellite view. Located atop the Pico de Atalaia, on the west coast of Ilha Selvagem Grande, largest of the Ilhas Selvagens. Site and tower closed; special permission is needed to visit the island. Site manager: Reserva Natural das Ilhas Selvagens. ARLHS MAD-011; PT-668; Admiralty D2768; NGA 23776. Note: The Ilhas Desertas (Deserted Islands) are a string of three rocky islands southeast of the Ilha de Madeira. The islands are uninhabited and have been a protected nature reserve since 1990. 2003 (station established 1961). Active; focal plane 72 m (236 ft); white flash every 4 s. 8 m (26 ft) round fiberglass tower clored with red and white horizontal bands; 300 mm lens. No photo available but Bing has a distant satellite view. 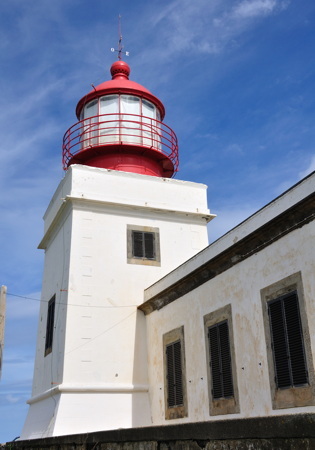 The original lighthouse was a 14 m (46 ft) hexagonal concrete tower with lantern and gallery. 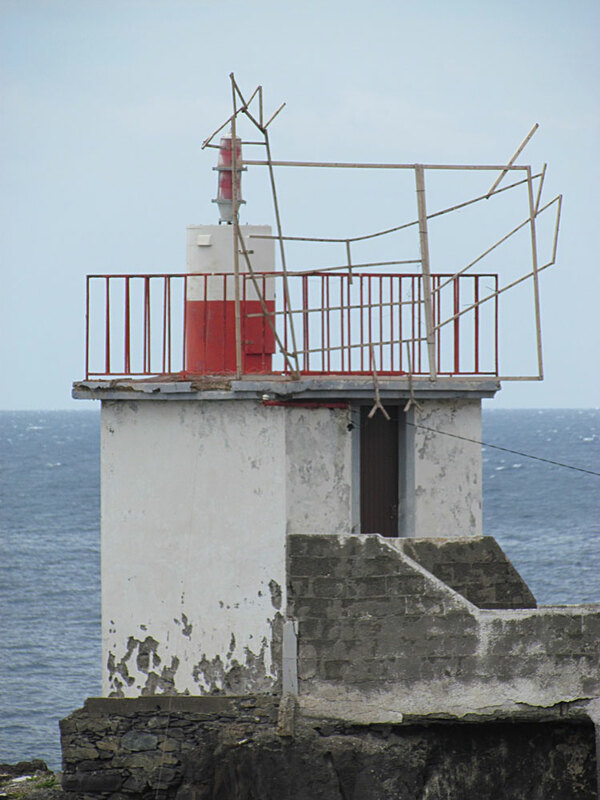 In the 1990s this lighthouse was found to be in very poor condition, so in July 2003 it was imploded and replaced. Located near the southeastern tip of the Ilhéu de Bugio, southernmost of the three Ilhas Desertas. Site and tower closed; special permission is needed to visit the island. Site manager: Reserva Natural das Ilhas Desertas. ARLHS MAD-007; PT-665; Admiralty D2722; NGA 23752. 1959. Active; focal plane 112 m (367 ft); two long (2 s) white flashes every 15 s. 14 m (46 ft) round cylindrical concrete tower with gallery, centered on a 1-story square concrete equipment room. Entire lighthouse painted white. Thanks to Stefan Leitner for contributing the photo at right. Trabas has Arndt's distant view from the sea and Bing has a distant satellite view. 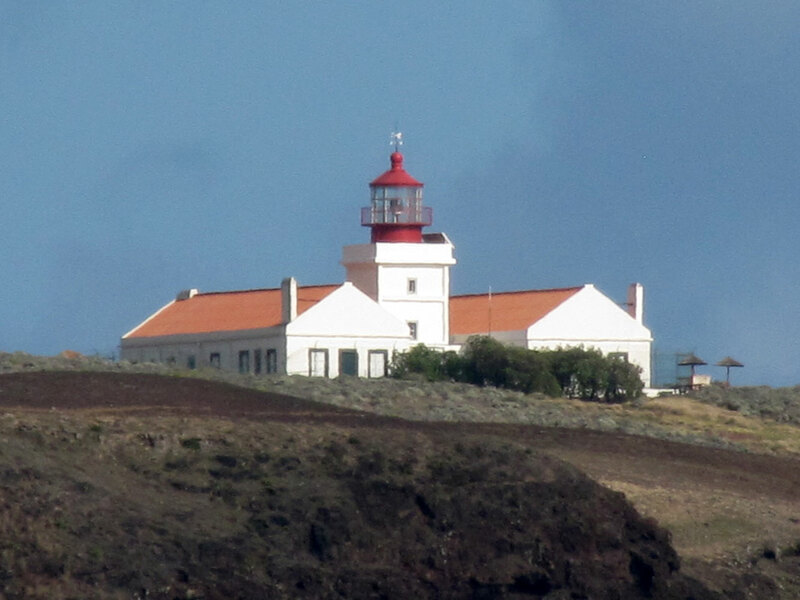 Located at the northern tip of the Ilhas Desertas, about 25 km (15 mi) southeast of the São Laurenço lighthouse. Site and tower closed; special permission is needed to visit the island. Site manager: Reserva Natural das Ilhas Desertas. ARLHS MAD-001; PT-663; Admiralty D2720; NGA 23748. Note: The island of Madeira is oriented east and west; it is about 130 km (80 mi) long and roughly 50 km (30 mi) wide. 1870. Active; focal plane 103 m (338 ft); white flash every 5 s. 10 m (33 ft) octagonal cylindrical stone tower with lantern and gallery, rising from a 1-story stone keeper's complex; 400 mm acrylic lens. The building is unpainted with dark and light stone in vertical stripes; lantern painted red. 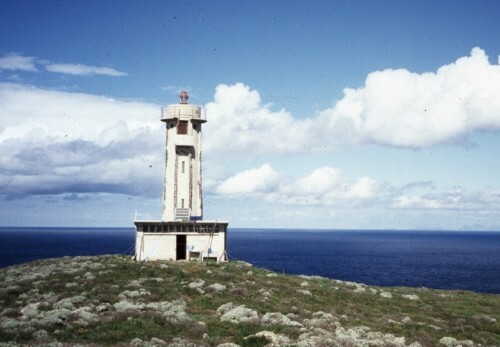 Wikimedia has Bjørn Christian Tørrisen's photo (seen at right) and several distant views, Trabas has Arndt's photo, Vitor Oliveira has a very distant view, Lighthouse Explorer has a historic postcard view contributed by Michel Forand, Klaus Huelse has the same postcard view, and Google has a good satellite view. 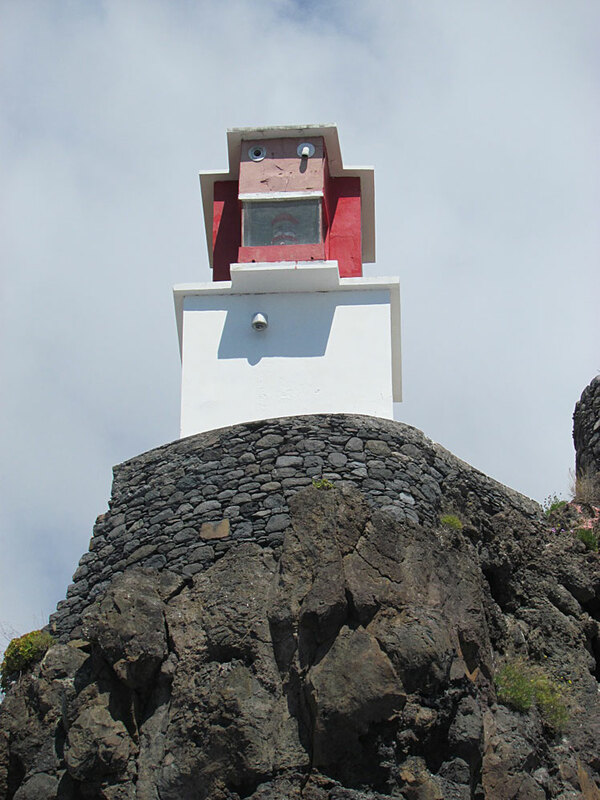 This lighthouse, the oldest in Madeira, stands atop a spectacular conical mountain (an extinct volcano). Located on the Ilhéu de São Lourenço, a small island off the eastern tip of the Ilha de Madeira. Accessible only by boat, and the island is a restricted natural area. Site and tower closed. Site manager: Reserva Natural da Ponta de São Laurenço. ARLHS MAD-004; PT-624; Admiralty D2726; NGA 23740. Date unknown. Active; focal plane 12 m (39 ft); white or red light depending on direction, 2 s on, 3 s off. 7 m (23 ft) round cylindrical fiberglass tower, colored with red and white horizontal bands and mounted on a square 1-story white concrete equipment shelter. Trabas has Arndt's closeup photo, and Google has a satellite view. Located at the southern end of the harbor of Machico on the southeastern coast of Madeira. Site appears open, but it's not clear if there is public access. Tower closed. PT-631; Admiralty D2728; NGA 23732. Date unknown. Active; focal plane 15 m (49 ft); red flash every 5 s. 6 m (20 ft) round concrete tower with gallery, painted with red and white horizontal bands. C.W. Bash has a photo, Trabas has Arndt's photo, Ricardo Figueira has a street view, and Google has a satellite view. Funchal, on the south coast, is the capital and chief port of Madeira. Located at the end of the breakwater in Funchal. Accessible by walking the pier. Site open, tower closed. ARLHS MAD-013; PT-637; Admiralty D2738; NGA 23728. 1937 (station established 1920s?). Active; focal plane 23 m (75 ft); red light, 4 s on, 2 s off. 5 m (17 ft) square concrete equipment room with gallery; the light is displayed from a short mast on the roof. Building painted white; the mast has a red horizontal band. Trabas has Silvano's closeup photo, C.W. Bash has posted a photo, Yang Meyer has another view, and Google has a street view and a satellite view. Located atop a vertical volcanic dike adjacent to the main pier at Câmara de Lobos, a village about 8 km (5 mi) west of Funchal on the south coast of the island. Site open, tower closed. ARLHS MAD-015; Admiralty D2744; NGA 23724. Date unknown (1920s?). 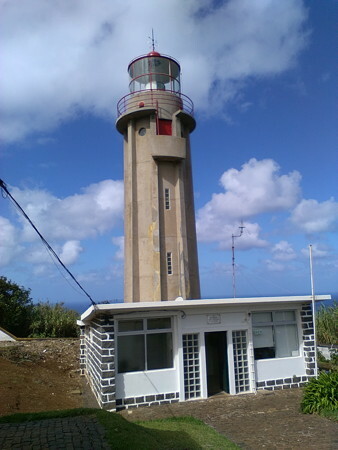 Active; focal plane 34 m (112 ft); red flash every 5 s. 6 m (20 ft) square cylindrical tower; the light is shown from a projecting "bay window" enclosure near the top of the tower. 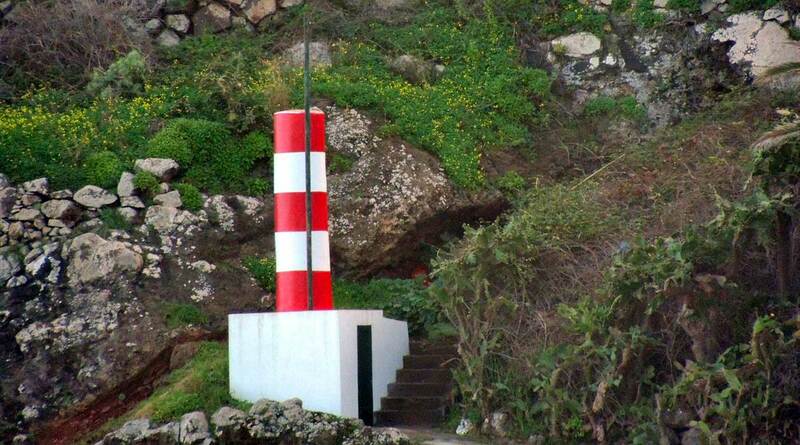 Upper half of the lighthouse painted red, lower half white. Trabas has Silvano's closeup photo, Wikimedia has several good photos, Lightphotos.net has Mark Woodburry's 2013 photo, and Google has a street view and a satellite view. Located atop a sharp promontory west of the harbor but east of the downtown area of Ribeira Brava, about 16 km (10 mi) west of Funchal. 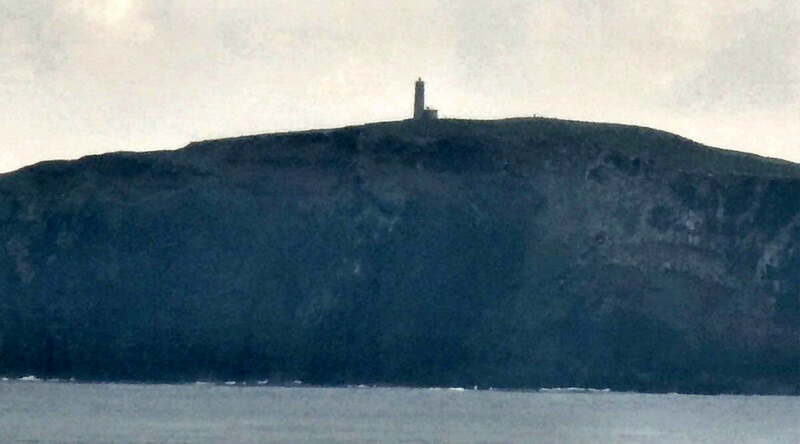 Site status unknown, but the lighthouse is easily viewed from below. ARLHS MAD-014; Admiralty D2746; NGA 23720. 1922. Active; focal plane 312 m (1024 ft); three white flashes every 20 s. 14 m (46 ft) square masonry tower with lantern and gallery, rising from a U-shaped 1-story keeper's complex. 2nd order Fresnel lens. Building painted white with black trim; lantern painted red. Hansueli Krapf's photo appears at the top of this page, Trabas has Seger's excellent photo, H.H. Schueller has posted a good closeup photo, Wikimedia has several good photos, Uwe Bücher has a street view, and Google has a fine satellite view. 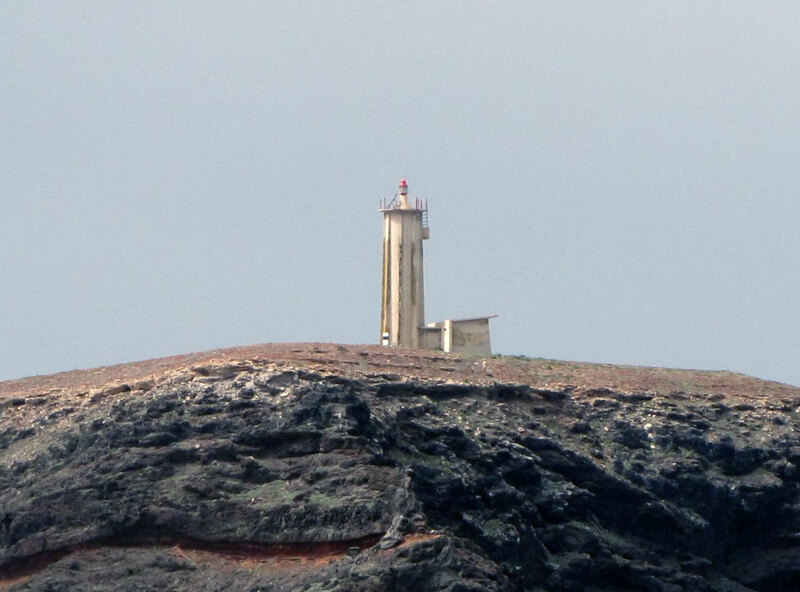 This is Madeira's best-known lighthouse by far, and also one of the highest lighthouses in the world. It commands a spectacular view westward over the Atlantic. Located on the western tip of the island; accessible by road. Site open, lighthouse open on Wednesday afternoons. ARLHS MAD-005; PT-656; Admiralty D2752; NGA 23712. Date unknown. Active; focal plane 65 m (213 ft); flash every 5 s, white or red depending on direction. Light mounted on a 3 m (10 ft) hexagonal equipment building. Trabas has Arndt's photo, Wikimedia has a 2015 photo, and Bing has a satellite view. Located atop a giant rock off the harbor of Porto Moniz, and the northwestern corner of the Ilha de Madeira. Practically inaccessible. Site and tower closed. ARLHS MAD-010; PT-658; Admiralty D2754; NGA 23708. 1959. Active; focal plane 271 m (889 ft); white light, 2 s on, 3 s off. 14 m (46 ft) round concrete tower with eight ribs, lantern and gallery, attached to a 1-story keeper's complex, Tower is unpainted white concrete; lantern dome painted red. A photo by Heinrich Mück is at right, Hansueli Krapf has a distant view, Sandro Figueira has a 2017 street view, and Google has a satellite view. 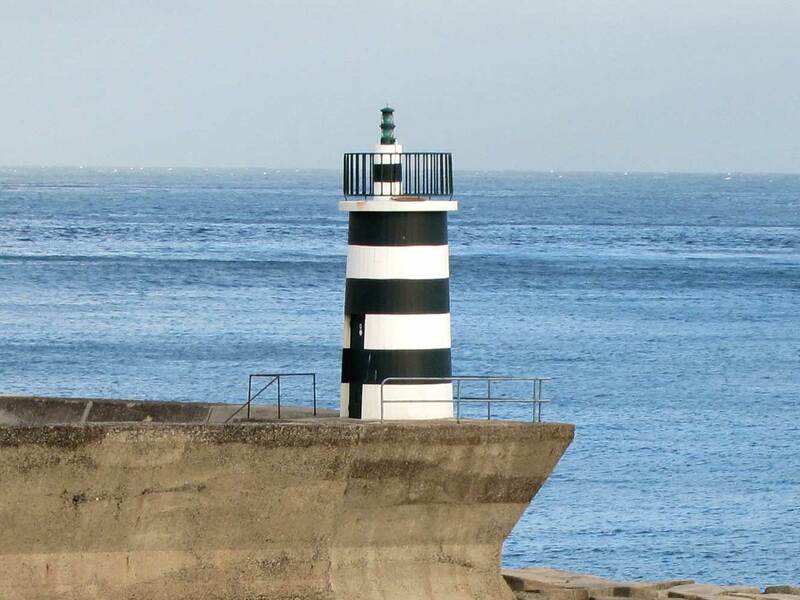 This lighthouse appears to share its design with the Carapacho, Ponta da Garça, and Ponta do Cintrão lighthouses in the Azores. Located high atop the Ponta de São Jorge on the central north coast of the Ilha da Madeira. Site open, tower closed. ARLHS MAD-008; PT-660; Admiralty D2755; NGA 23744. Note: Porto Santo is an inhabited island, 11 km (7 mi) long and 6 km (3.5 mi) wide, about 50 km (30 mi) northeast of the Ilha de Madeira. A popular resort destination, the island is accessible by air or by ferry from Funchal, Ilha da Madeira. 1959. Active; focal plane 130 m (427 ft); white light, 3 s on, 12 s off. 14 m (46 ft) round cylindrical white concrete tower with lantern and gallery, attached to a 1-story equipment shelter. Building painted white. Wikimedia has a photo and a distant view by Rui Branco, Trabas has Seiler's photo, several distant views are available, and Google has a satellite view. Located on a small island off the southwestern tip of the Ilha de Porto Santo. Accessible only by boat. Site and tower closed. ARLHS MAD-002; Admiralty D2762; NGA 23768. 1900. Active; focal plane 124 m (407 ft); three white flashes every 15 s. 15 m (49 ft) square masonry tower with lantern and gallery, rising from a U-shaped 1-story keeper's house. Building painted white with gold trim; lantern painted brown. 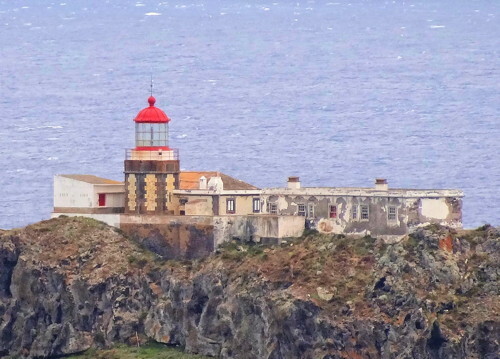 Rui Branco's photo is at right, Trabas has a good photo by Seiler, Vitor Oliveira has a very distant view of the lighthouse perched atop the island, and Google has a good satellite view. The Ilhéu de Cima is a small (but high) island off the northeast coast of the Ilha de Porto Santo, helping to shelter Porto Santo's harbor of Vila Baleira. Accessible only by boat. Site open, tower closed. ARLHS MAD-006; PT-610; Admiralty D2756; NGA 23756. Date unknown. Active; focal plane 13 m (43 ft); red flash every 4 s. 8 m (26 ft) round cylindrical concrete tower with gallery, painted with red and white horizontal bands. 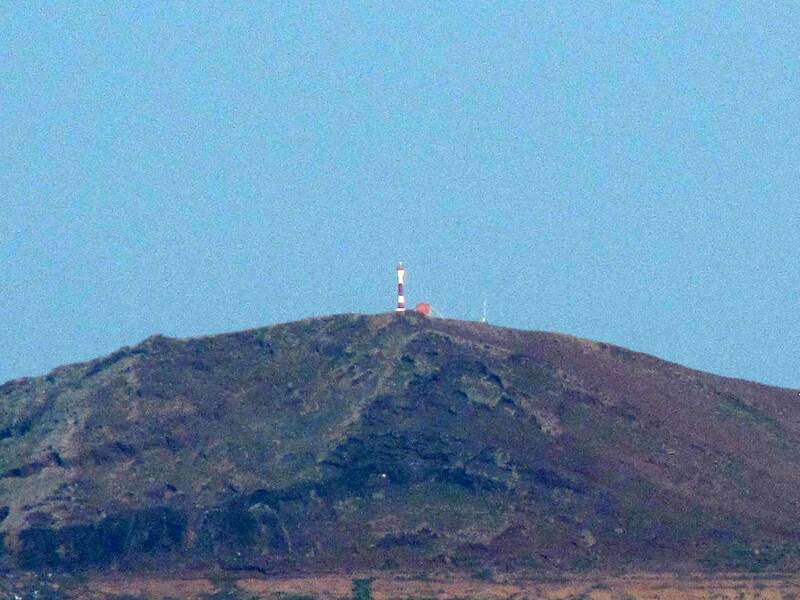 Don Amaro has a good photo, A.S. Figueiredo has a photo, Ricardo Gonçalves has a view from the sea, and Trabas has Seger's distant photo, but the tower is hard to see in a Google satellite view. Located at the end of the north (really the west) mole of the new Vila Baleira harbor of Porto Santo. Site status unknown. Admiralty D2757.2; NGA 23765. Date unknown. Active; focal plane 17 m (56 ft); green flash every 4 s. 9 m (30 ft) round cylindrical concrete tower with gallery, painted with green and white horizontal bands. Trabas has Seger's distant photo, but Google's satellite view does not show the tower clearly. Located at the end of the south mole of the new Vila Baleira harbor of Porto Santo. Site status unknown. Admiralty D2757; NGA 23766. 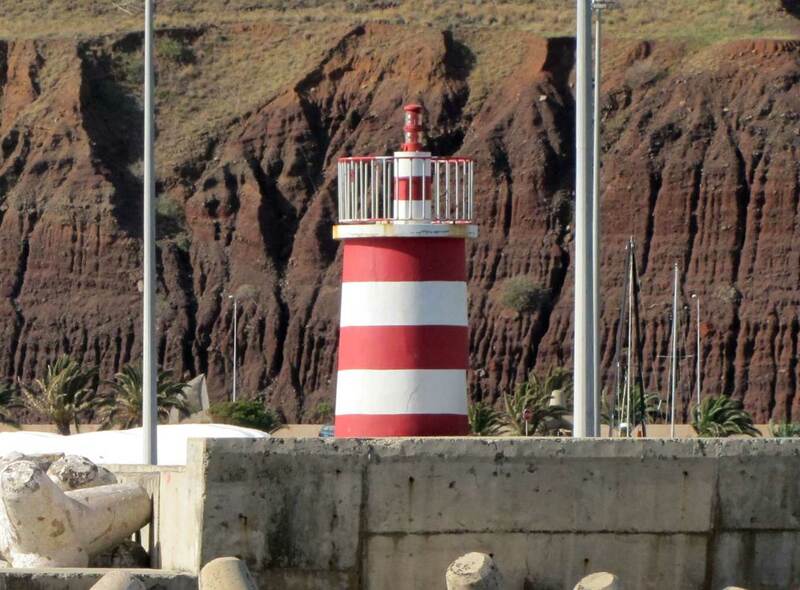 Caniçal Marina, near the eastern end of the Ilha de Madeira, has an octagonal lighthouse, but we don't know if it is active. Google has a street view and Bing has a satellite view. Not listed by the Admiralty. Posted January 4, 2006. Checked and revised January 9, 2019. Lighthouses: 15. Site copyright 2019 Russ Rowlett and the University of North Carolina at Chapel Hill.